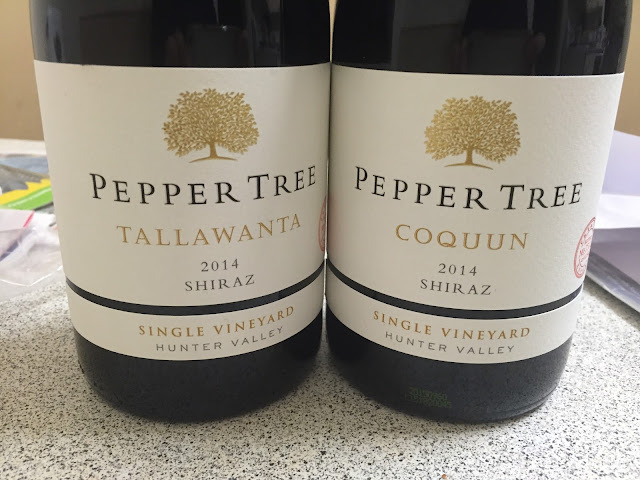 Following on from my little spiel on the glorious 2014 Hunter Valley vintage, let me present two wines that prove the point, the 2014 Pepper Tree Coquun & Tallawanta Shiraz. Both of these wines are sourced from the Tallawanta vineyard, a renowned plot located next to Harrigans pub first planted back in 1920. Tallawanta has had various owners over the years, the fruit going into many different Hunter labels. 2014 will be the last year that Pepper Tree get the fruit though, as Brokenwood have leased it from the Roche family as of 2015 on. These two wines will thus act as the the final hurrah for the Pepper Tree Tallawanta based wines. Speaking of last hurrah, Pepper Tree Chief Winemaker Scott Comyns was controversially made redundant a few weeks ago, with Briar Ridge winemaker Gwyn Olsen now taking charge of both labels. That created a bit of a stir through the Hunter winemaking community, but it might well end up with a happy ending, as Scott has already said to have secured some fruit for his new label (watch this space). Gwyn is a clever winemaker (and great dancer) too, so the Pepper Tree range is still in good hands. From the outset, these are both intensely coloured for Hunter Shiraz – really inky purple. Blood plum skin purple. Deeply concentrated nose too – again, inky for the Hunter. What’s amazing is just how big a step up there is between the concentration of these two. The Coquun is medium weight, purple and more classically, well, medium, if still drenched with purple berries. Yet the Tallawanta is even bigger again – more purple, more juicy and with even more mouthfilling flavours and longer tannins. If you didn’t know it, you’d say these were from different vineyards, the Tallawanta from a warmer spot or older vines. If you’ve ever tried the Henschke Hill of Roses versus the Hill of Grace, it’s like that difference in power and complexity. You know what? I like both wines. The Tallawanta is more grandiose and South Aussie inspired, the fractionally more moderate Coquun is from the Hunter. Both have a really strong, earthen purple fruit limitless that marks them as absolute top tier Hunter Shiraz in the modern, ripe style (which is also an old school style if you’ve had some of the hotter year 15% alcohol Lindemans Hunter River Burgundies), with fine tannins and a wonderfully classic form. Ultimately these are two quality Hunter reds, the Tallawanta just edging out for its unquestionable extra dose of specialness. The only slight distraction maybe some quite tart acidity. Quality regardless. Pepper Tree Reserve Coquun Shiraz 2014 – Drink 2014-2032, 18/20, 93/100. 14.2%, $90. Pepper Tree Reserve Tallawanta Shiraz 2014 – Drink 2014-2032, 18.5/20, 94/100. 14.2%, $145.